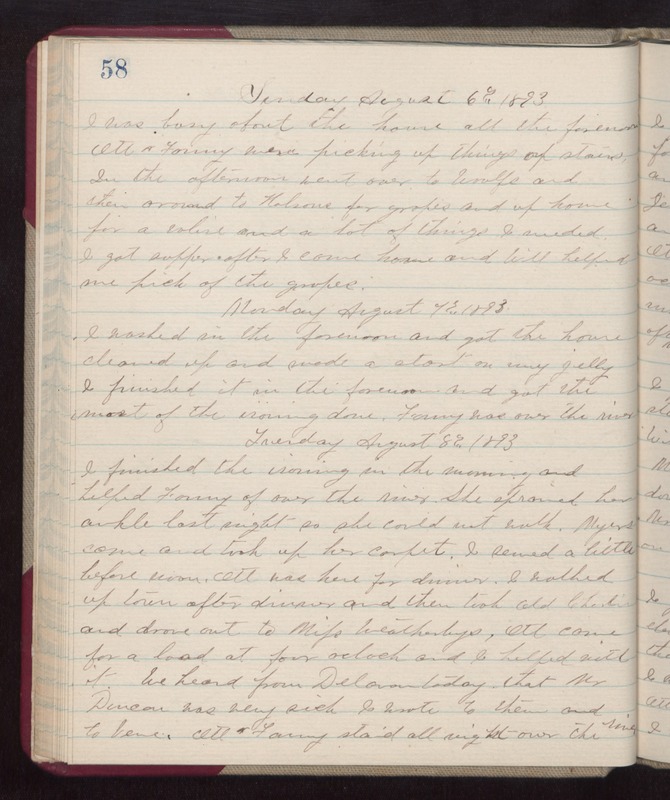 Sunday August 6th 1893 I was busy about the house all the forenoon. Ott & Fanny were picking up things up stairs. In the afternoon went over to Woolfs and then around to Halsons for grapes and up home for a valise and a lit of things I needed. I got supper after I came home and Will helped me pick of the grapes. Monday August 7th 1893 I washed in the forenoon and got the house cleaned up and made a start on my jelly. i finished it in the forenoon and got the most of the ironing down. Fanny was over the river. Tuesday August 8th 1893 I finished the ironing in the morning and helped Fanny of over the river. She sprained her ankle last night so she could not walk. Myers came and took up her carpet. I sewed a little before noon. Ott was here for dinner. I walked up town after dinner and then took Old Charlie and drove out to Miss Weatherlys. Ott came for a load at four oclock and I helped with it. We heard from Delavan today that Mr Duncan was very sick. I wrote to them and to Vene. Ott & Fanny staid all night over the river.